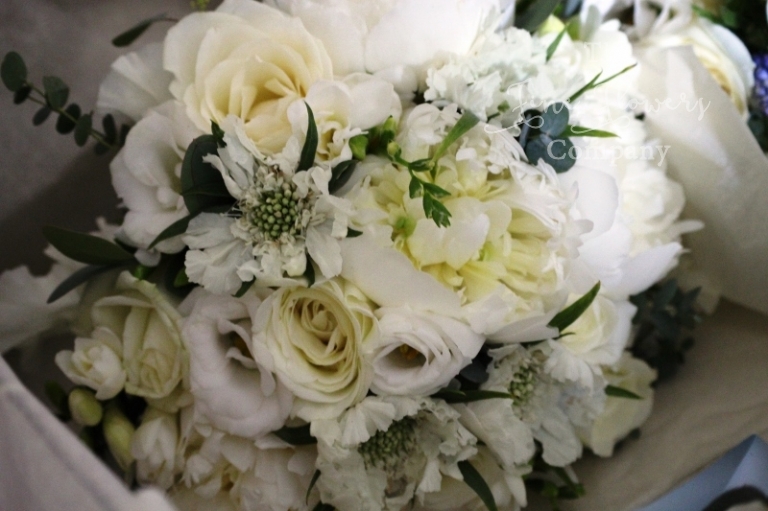 Karen carried a stunning bridal bouquet of paeonies, scented Norma Jean roses, white scabios, scented freesias and silvery populous eucalyptus. For Karen and Paul’s grown up daughters who were the bridesmaids, and for the little flower girls, we made up matching bouquets with added pale blue muscari to echo the colour of their pale blue dresses. 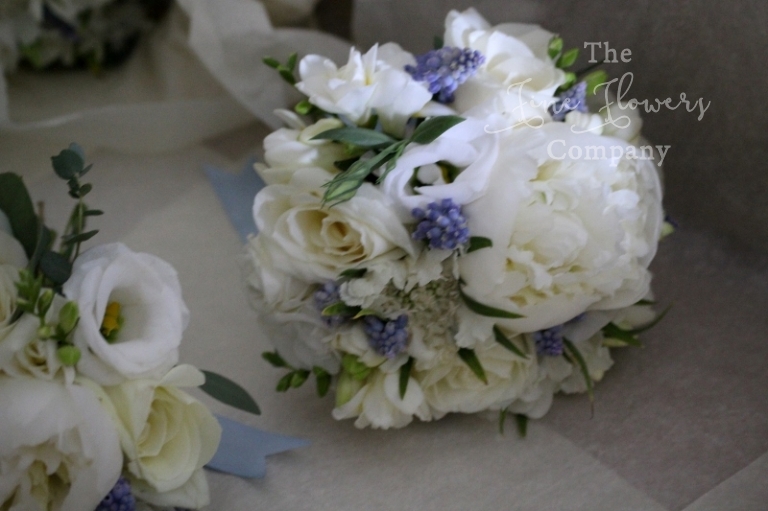 The men wore classic buttonholes of Avalanche roses and blue muscari. 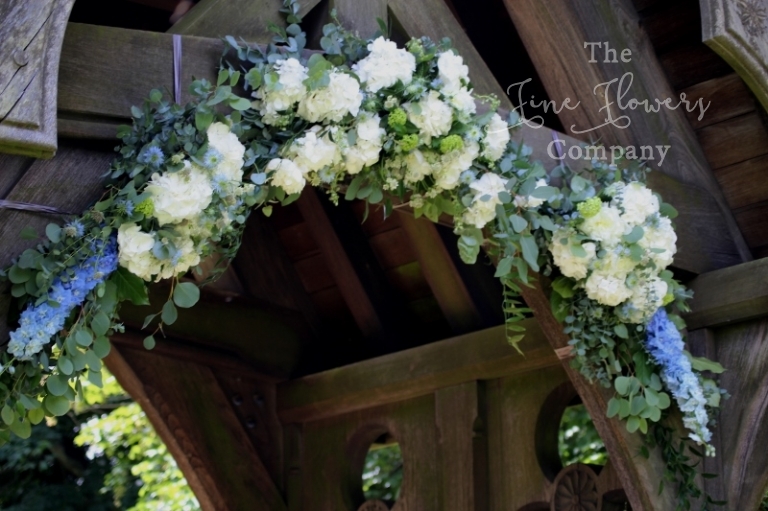 For the church ceremony, we welcomed guests with gorgeous lytch gate arch of pretty flowers. Then, as soon as you stepped into the beautiful St Barnabas church, the lovely old font was dressed with a very romantic silver urn centrepiece surrounded by storm vases with candles. The ceremony area was flanked by two more amazing tall centrepieces, and the aisle was dressed with gorgeous pew end posies of roses, muscari, blue nigella and silvery eucalyptus. Over at Polesden Lacey, for an equally dramatic welcome, we created a bespoke dramatic flower display created in situ, on the the wraught iron sculpture atop the well at the front of the house. On such a gorgeous sunny day, this attracted lots of attention from the sun-seeking visitors to this stunning National Trust property. Up on a little hill overlooking the house, just a hundred yards away from the main entrance to the house, was the setting of the wedding marquee, amidst impeccably maintained lawns. The wedding reception tables were dressed mainly with tall, wild and flowy candelabra displays with roses, hydrangeas, palest of blue delphiniums, nigella, astrantia and silvery eucalyptus. A few of the tables were dressed with low opulent rose bowls of ivory and blue English country garden flowers. We framed the top table with two more dramatic urn displays with tall white and blue delphiniums, lots of hydrangeas, roses and peonies, with astrantia and wild looking nigella. In the middle of the top table we placed a waterfall centrepiece and lined up the edge of the top table with vases of floating candles and small posies of flowers. We specialise in wedding flowers and events, so if you are planning a wedding at Polesden Lacey or nearby, or for more wedding ideas please visit our main site with extensive photo gallery of beautiful wedding flowers.